With the celebrations of all these other anniversaries going about it is easy to forget the adventures of Kunio, which also celebrated thirty years in 2016. Despite being absent from most Western gamer’s memories in the past several years (despite the odd virtual console re-release), the legacy of Technōs most famous delinquent high school student is as lengthy and varied as one would expect from three decades of mischief and mayhem. While most gamers will have Kunio memories from his many entries in the 8-bit era, there were also a few 16-bit outings that never made it to the west. Most of them are actually rather good. 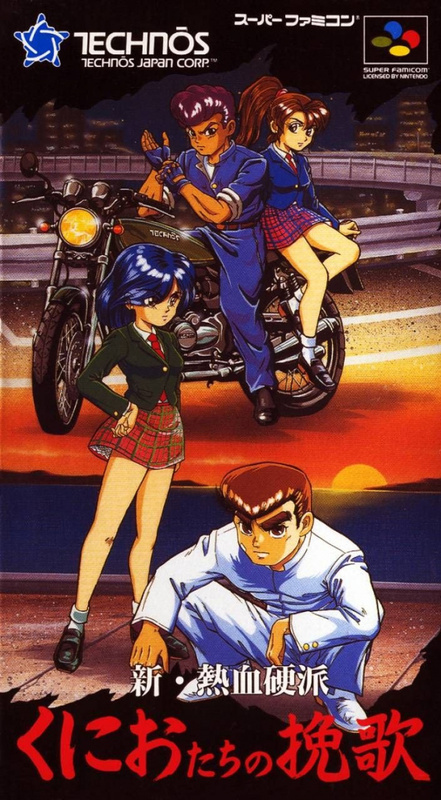 But does the lengthy title of "Shin Nekketsu Kōha Kunio-kun: Kunio Tachi no Banka" equal brilliance? The (rather bleak) game intro shows an unfortunate bike hit and run that ends up taking the life of an innocent civilian, who saves a school girl from being the victim. 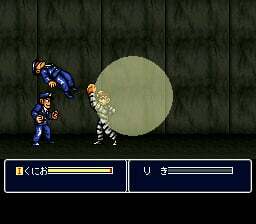 Riding the bike away from the scene, a rather ominous looking Kunio and Riki are identified by the would-be victim. 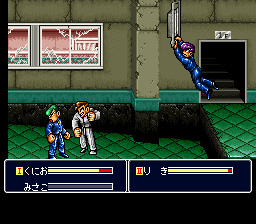 It seems like an open-and-shut case for the police who proceed to pick up Kunio and Riki at Nekketsu High School and throw them in the big house (we can only assume there has been some sort of trial first). The prison bus pulls over and the handcuffed, prison uniformed Kunio and Riki step off, continuing to proclaim their innocence in the whole affair. But they get no sympathy from the first antagonist of the game, Police Chief Takayama, prison supervisor and father of Kunio's classmate Mamoru. Both heroes get throw in a prison cell with other inmates and proceed to make friends (please read "beat them senseless"). 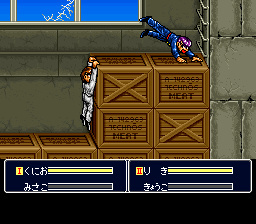 A few days later, classmate Hiroshi pays a visit to the jailbirds and reports that things have gone quite haywire at Nekketsu after Kunio's incarceration. Another ruffian, Daiki, has taken over the High School and is making his moves on Misato, Kunio's current love interest. There have also been reports of students spotting both Kunio and Riki lookalikes out and about in downtown. Yep, it is time for a jail break. 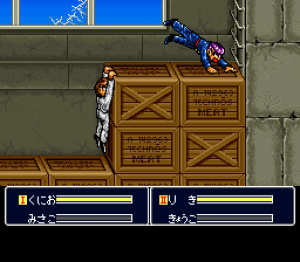 Thanks to the old trick of fake food poisoning performed by fellow inmates, Kunio and Riki beat their way past prison guards to jump over the wall thanks to the help of Hiroshi. Arriving at Nekketsu High and sneaking around, Kunio confronts Misato and proceeds up the school building to beat up Daiki, who is wearing Kunio's legendary white uniform. And that is the game prologue done - time to ditch those prison uniforms for more classic Kunio wear. Misato promptly joins the team and the newly formed trio move to Riki's Hanazono High, taken over by Ryuuta, who is not only demolishing the school building but is also forcing students to work at the local amusement park. Dastardly! After Riki shows Ryuuta the error of his ways (read "mercilessly beating up"), his love interest Kyoukou joins the team. At this point you have finally gathered all four playable characters. After over half an hour of gameplay the adventure truly starts, and all four of our heroes set out to try and prove Kunio and Riki's innocence on that bike hit and run incident. Did we just spend the previous four paragraphs of the review narrating the game's prologue? Yes indeed, because that is exactly part of the game's charms; you just keep on playing to find out where the next turn of events will lead Kunio and his team. As one might expect from a Kunio game, controls are really tight, with Technōs and Almanic this time making full use of the Super Nintendo joypad buttons: "B" jumps, "Y" is for punches, "A" is for kicks, "X" is the back attack and the shoulder buttons allow you to block. Once you get the guy's school uniforms, holding block and pressing A, B, X or Y will unleash a special move. Each move is specific to each of the four characters, adding variety to the beatings (we must admit to being big fans of Riki's machine gun punch). The game delivers all sorts of different ways to beat up your enemies: running attacks, jumping strikes and lots of moves to deliver punishment on downed opponents, including the classic mount position to dish out some vicious face punches. However, this is where the game's nods to previous entries come to a halt. Longtime fans of the series may not be happy to learn that the RPG-lite elements that made previous entries so unique are gone. There are no longer shops to explore and learn new moves and no fancy restaurants to recover health. In fact, there are no pickups in-game whatsoever. No weapons and no iconic, strangely pre-cooked food items placed on the floor. You have to manage each level with your wits and by juggling your four heroes' health by hitting Select to switch between them. This makes the whole experience a much more streamlined affair when stacked up against previous games. It is a big departure from the established basis of the series, but the tradeoff can be seen and heard instantly with this game easily featuring the best graphics in the series, from the varied and detailed backgrounds to the lovely sprite work of both protagonists and antagonists. The music retains the IP's iconic melodies but is by far the best ever to feature in the franchise, with over thirty tunes working the Super Nintendo's sound chip while you work on your foolish enemies. A welcome password system (given out by pressing start to pause the game) ensures that you can resume your adventure at any given point. Since the RPG elements have been taken out and due to the game's new linear nature, it is quite possible to enjoy this game in its native Super Famicom 1994 release, missing out the extensive plot. Eight years after its original debut, AGTP released a fully translated English patch which you can use with the original cartridge on your RetroN 5 or Retro Freak. Beware: Gideon Zhi and Datenshi did not soften anything coming out of Kunio's and Riki's filfhy mouths! This game would come with a PEGI 18 and MATURE 17+ rating if ever released in the West (or most likely would have removed all foul language in order to get a younger certification rating back then, the target audience at the time). You didn't really expect delinquent students to be polite, right? Hot blooded indeed. "Shin Nekketsu Kōha Kunio-kun: Kunio Tachi no Banka" is not only a mouthful but an excellent side scrolling beat'em up, more than standing up to the test of time and easily matching other top contenders for the SNES genre crown, like Teenage Mutant Ninja Turtles IV: Turtles in Time or Final Fight 3. Great graphics, great music, good stage variety and fun to play both alone or with a friend mean you should consider this a worthy addition to your Super Famicom collection. In fact, as far as Kunio fighting games go, this might just be not only the best SNES entry of the series, but the best overall fighting game of the whole franchise. Considering the amount of titles and overall high quality therein implied, that alone is one impressive feat. 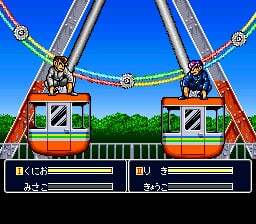 Plus it is part of a very restricted club of video games that feature a carnival and rollercoaster rides halfway into the action, sharing this unique treat with Technōs very own The Combatribes (which gets a small cameo in this game) and Konami's The Adventures of Batman and Robin. We guess even delinquent, potty mouthed students are unable to say no to some cotton candy between beatings. That title just rolls off the tongue.........like sandpaper. In Kunio we trust. Enjoy the review! @Fandabidozi I doubt it will ever happen sadly. The game fails very hard at the current political correctness society we live in, was never officially localized and I have no clue who would need to clear the rights for this re-release. Grab the SFC cartridge instead. Maybe we'll get access to it if/when the Switch's Virtual Cobsole finally lands. It'll be Nintendo's first region free VC, which should open up a lot of Japanese-only gems. @Shinryu Speaking of which, there seem to be a couple of names that have been slightly lost in translation in the review. I think 'Misato' should be 'Misako' and 'Kyoukou' should be Kyouko/Kyōko (though this one's pretty minor). Oh, and also 'filfhy'. I hate to be that guy, especially as my posts are invariably overflowing with misspellings and typos, but I thought it best not to sit on the ones I'd noticed. @Maxz If we can't review "Tekken 7" due to lack of the bloody thing on Switch (buuuuuuuuuuuuuuuuuuuuu! ), you get Kunio reviews instead. Fighting on motorcycles . . . excellent!! @bluedogrulez An actual game was soon after built on that engine, it actually became a spin off since the producers were unable to secure Kunio's license at time of release. @bluedogrulez My pleasure. I knew all those old magazines I picked up when I was young would pay off in the future. @SLIGEACH_EIRE Compared to Celtic languages it actually does. Never heard of this before--but, given the name, that's not too surprising. This looks great. Maaaaaybe I shall import. Love these retro reviews, and I've been missing them. Thanks @Shiryu! @bimmy-lee My pleasure. Thanks to the Switch launch and constant flow of games I no longer have as much time as I would like to keep pumping these weekly. good jab on the review. 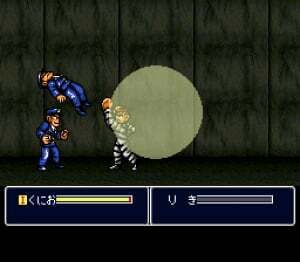 AS much as I'd like to see a Yu Yu Hakusho mod skin for this game, I'd really like it if they'd give shodai nekketsu kouha kunio-kun an actual release; I wouldn't even care if they called it Super Kenny Smack'em Up-kun. This game is really good. I'm more a fan of Shodai Nekketsu Kouha, but this is a really good one. It feels more like a later Double Dragon game, but with Kunio and Riki. The story gets really intense, and the fight system is spot on. If you like beat-em-up games and you haven't played this, go do it now. I recommend playing Shodai Nekketsu Kouha also. That game is open world, SNES style. The "barriers" are super high level enemies. You can defeat them, but you better get your weaving game down, or you're gonna get knocked out. @Shiryu - Understandable. I'll take what I can get, and I'll be happy I got it. These are always well written and very informative. Take care. @Shiryu Awesome! Just checked it out! God what a good game. @nuff64 I think it would have done rather well in the West. @GravyThief My pleasure. I wish I still had the time to pour these out one per week. @Shiryu Well I certainly wouldn't complain at weekly retro Japan focused reviews. I've really got into games for the Japanese Famicom/SFC/N64 recently. Mainly because you can buy the carts cheap on eBay vs. EU/US versions, but with a bit of perserverence and checking on YouTube you can easily enjoy many of the games despite being in Japanese. Only the text heavy RPGs pose a problem, but a lot of the best ones have been translated anyway. It's opened up a whole world of 'new' retro games for me, I love it. @GravyThief It's a gift that keeps on giving. It is however a real shame prices are hiking up so fast and out of control that even I had to admit failure and had to gave up on collecting Super Famicom carts.